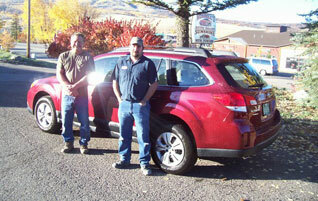 We are your full-service auto body shop and collision repair specialist, located in Steamboat Springs, Colorado. We feature a state-of-the art facility and expert technicians, who have a combined 90+ years experience. Our focus is on quality and results, and we guarantee our craftsmanship for the owner's life of the car! "Don't take your car anywhere else!" "Russell's is the best." -Mix Beauvais. 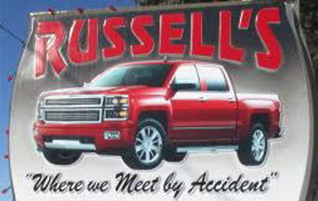 Russell's is the oldest, most experienced, auto body shop in Steamboat Springs. Our staff has over 90 years of combined experience, not including that of body shop and paint experts Terry and Phil! Serving Steamboat Springs with superior quality and service since 1958. Welcome to Russell's Auto Salon! We are your full-service auto body shop and collision repair specialist, located in Steamboat Springs, Colorado, featuring a state-of-the art facility and expert technicians, who have a combined 90+ years experience. Our focus is on quality and results, and we guarantee our craftsmanship for the owner's life of the car!